A Khemka, N Chakrabarti, Chitale, A Uttarwar. Immunomodulation of Indolent Ulcers. The Internet Journal of Surgery. 2007 Volume 15 Number 2. 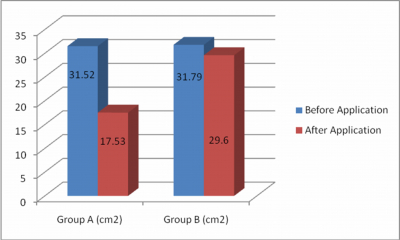 Methods: A case-control study of 50 patients in the study group (Group A) and 50 patients in the control group (Group B) was conducted at K. J. Somaiya Medical College and Research Centre, Mumbai, India. The patients selected had non-healing wounds either in the form of ulcers on the lower extremity or pressure sores. Patients in group A had placental extract (PLACENTREX) applied during dressing while group-B patients had dressings done with normal saline. All patients with gross necrotic infection underwent surgical debridement once. Efficacy of the PLACENTREX application was assessed (1) on the basis of MAGS (Microscopic Angiogenesis Grading System) by looking for Vasoproliferation (N), Endothelial Cell Hyperplasia (E) and Endothelial Cytology (X); the score was calculated as KnN + KeE + KxX, and (2) clinically on the basis of decrease in mean surface area, no signs of local inflammation and no slough or discharge from the wounds. The end point of the study was determined as the development of healthy, pink, pin-point, velvety granulation tissue without infection. The adverse effects due the application of placental extract, if any, were to be noted. Results: Results were tabulated in all patients including controls. Statistical analysis was done using the unpaired t-test and p-values were determined. 1) A considerably higher MAGS Score was seen in group-A patients. 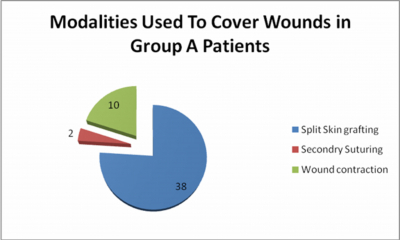 2) In group-A patients the mean surface area of wounds decreased from 31.52cm2 to 17.53cm2 at the end point of the study while a much lesser decrease was seen in the control group. The clinical end point of the study was reached in approximately 19 days in group A and about 36 days in group B. Negligible side effects of Placentrex were seen. Conclusion: Placental extract in the form of PLACENTREX was found to be an effective, easily available and cheap agent with no side effects as a topical agent in the treatment of non-healing wounds. Wound healing is a process of complex events which occur in an orderly and almost predictable fashion. During this process, cells, proteases, growth factors, proteins and matrix components interact with each other leading to anatomical and functional integrity which gives the skin its original structure. In most cases, wounds heal without any problems such as infection. An acute wound becomes chronic when healing does not take place in this manner due to a large number of factors such as diabetes, vascular disease, etc. Any surgical intervention will result in a wound in order to gain access to and deal with the underlying pathology. In both situations, the surgeon's task is to remove and/or repair the damaged structure and harness the process of wound healing to restore function. For a prolonged duration of human history, complete or complicated wound healing was the rule and not the exception. The basic principle of wound care and antisepsis introduced during the past century aided and eased the surgeon's job considerably. For centuries people are using various topical agents for the healing of wounds and have always improvised the agent according to the need. Since the beginning of medical history recorded, topical agents have been used for wound management and to control bacterial infection. The non-healing wound is a significant health-care problem adding to the patient's health-care expenditures, in addition to the pain and suffering. Failure of the wound to heal may result from diseases such as diabetes or certain metabolic factors, such as low vascular supply. Pressure sores and leg ulcers constitute two of the largest categories of chronic wounds. Wound care is a costly burden to the individual as well as the health care system. To meet these demands, clinicians are becoming familiar with an increasing number of new modalities that not only hasten wound healing but can be used easily in the home setting. Researchers are responding with new findings based on clinical data that will dramatically alter the approach to wound care today and in the future. Studies have shown that a moist wound environment promotes more rapid healing. Although the phases of healing are the same for all patients, their rate depends on several associated factors. Occlusive dressings provide considerable pain relief, but the exact mechanism is unknown. They may relieve pain because they maintain the normal environment for the free nerve endings that signal pain as well as because they protect the wound from external stimuli (9) . In the present study, we study the effects of placental extract in the management of non-healing wounds. The presence of nucleotides like DNA & RNA in the placental extract facilitates simultaneous anti-inflammatory and wound-healing actions. Wound healing is rather by reorganization than by regeneration and is thought to be mediated by the hydroxyproline synthesis. This agent has also been shown to possess anti-oxidant and immune-recrudescence properties which further enhance wound healing. This study will help us to draw conclusions regarding the acclaimed wound-healing properties of placental extracts. To evaluate the use of human placental extract as a single agent for topical application in dressing of non-healing wounds. The preparation used was PLACENTREX from Albert David Ltd., Kolkata, India. The study was conducted with application of Placentrex gel on the non-healing wound in 50 patients with a control group of another 50 patients in whom wound dressing was done only with normal saline. To study and evaluate results based on several subjective and objective findings including MAGS Score, reduction in wound size, time taken for development of healthy granulation tissue and side effects of the agent, among various other parameters. Appropriate conclusions were then to be drawn. This was a prospective comparative type of study. For Group ‘A', the placental extract used was Placentrex gel manufactured by M/s Albert David Limited, Kolkata, India. Each gram of Placentrex gel is derived from 0.1g of fresh human placenta with the preservative benzyl alcohol IP 1.5 % v/v which is tested for HIV and HCV antibodies, and Hepatitis B Surface Antigen-free. For Group ‘B', normal saline was used as a topical agent. All patients with gross necrotic infection underwent surgical debridement once. All infected wounds were put on a course of systemic antibiotics and considered for the study only once they were free of all infection as proved by bacteriological culture and sensitivity. The clinical end point was defined as pink, pin-point, healthy granulation tissue, which bleeds on touch. 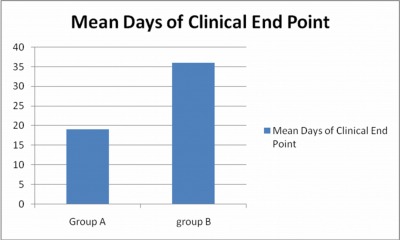 Assessment of improvement of wound status was done under the following headings in both the study and the control group separately (values of days were mean values). The statistical test applied was the unpaired t-test and the p-values were calculated.
. Mean surface area of the wound at the time of starting and end point of the study. Days taken to reach a state of zero inflammation as assessed clinically. Days taken to reach a state where there is zero slough in the wound as seen macroscopically. Days taken to reach a state of zero discharge from the wound. Days taken to reach full granulation, i.e. pink, pin-point, velvety tissue that bleeds on touch, i.e. end point of the study. MAGS (Microscopic Angiogenesis Grading System): Histopathological evidence in terms of vascular proliferation (angiogenesis), endothelial cell hyperplasia and endothelial cell cytology. Adverse reactions to the placental extract. We looked at 4mm paraffin sections stained with H&E using 400 times magnification. The MAGS score was calculated as MAGS = Kn N + Ke E + Kx X.
N represents the number of vessels per high-power field. Kn is a constant used to correct for various fields of other microscopes so that they are equal to the magnified area described. Ke is a constant with a value of 3. E is the number of endothelial cells lining the cross section of a capillary. Kx is a constant with value 6. X stands for histological appearance of an individual endothelial cell graded on the basis of regenerative appearance. X was given 0-5 points based on histological appearance of endothelial cells. The MAGS score using the above mentioned formula ranges from 0 to 100. Charting of pain was done on the Visual Analogue Scale. This study has been carried out in the K. J. Somaiya Hospital and Research Centre, Mumbai. One hundred patients were included in the study out of which 68 were males and 32 were females. Patients between 20 and 60 years of age were included. Those above 60 years have been excluded due to possibility of associated illnesses. 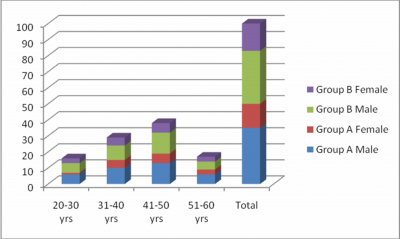 The maximum number of patients (48%) was found in the age group of 26-50 years. In our study, out of the fifty patients of group A, thirty-six suffered from ulcers of the lower extremity, while fourteen had pressure sores. Of our 36 patients with ulcers of the lower extremity, 28 patients (77.78%) had ulcers of the foot, more than 75% of these being on the plantar aspect. A common association with non-healing wounds, especially in the lower extremity, is diabetes, the well-known entity of ‘diabetic foot'. In our study, 24% of patients were diabetic. Saraf et al (10) reported an incidence of 23% for diabetes in a study on non-healing wounds, with the commonest cause of non-healing wounds in and around Varanasi being leprosy. Knighton et al (11) , however, documented that cutaneous non-healing wounds were most frequently caused by diabetes (58%). Diabetes is an important factor with both systemic as well as local implications, which affects the outcome of the treatment of these patients whatever the method followed. While chronic changes due to diabetes which had already occurred in the tissues could not be reversed, blood sugar levels were controlled before subjecting these patients to the trial. Thus, our study included only those patients who were normoglycaemic. Group-A patients, where topical placental extract was used for wound healing, reached the clinical end point in 19 days while the group-B patients with the normal saline dressings only achieved the same in 36 days. These healing patterns suggested a significant difference. The beneficial effects of Placentrex started to appear from week two onwards, the discharge and foul smell started to disappear and the granulation tissue had started to appear. A significant reduction in the wound size was observed by the end of week two in group-A patients whereas the control group had to wait at least till week 5 to see these changes to take effect. The surface area of the wound at the beginning of the study was found to be ranging from 12 cm 2 to 113.6 cm 2 in the study group with a mean value of 31.52 cm and standard deviation of 21.62, while in the control group the range was from 12.2 cm 2 to 114.8 cm 2 with a mean of 31.79 cm 2 and standard deviation of 22.03 (Table 2). Total leukocyte count at the beginning was almost identical in the study and control group at 13300/c.mm and 13530/c.mm, respectively. The mean time for achieving ‘zero inflammation' was 10 days with use of placental extract while it was 20 days with use of normal saline. 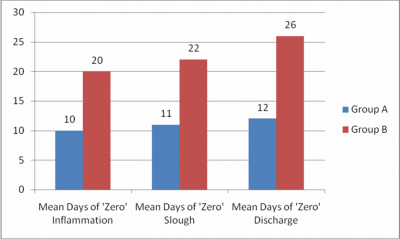 The mean time for achieving ‘zero slough' with the use of placental extract was 11 days while with the use of normal saline it was 22 days. The mean time for achieving ‘zero discharge' with the application of placental extract was 12 days while with the use of normal saline it was 26 days. The clinical end point of the study was achieved at about 19 days with the use of placental extract while it was at 36 days with normal saline dressing. The microbiological flora in a wound is an important index of local infection. Seventy-seven percent of the wounds showed bacterial contamination. Wound swab was sent for culture and sensitivity at the beginning of the study. The commonest organism cultured was Pseudomonas aeruginosa (30%) followed by Staphylococcus aureus (19%). In our study, all patients with infected wounds were put on systemic antibiotics depending on the sensitivity report but metronidazole was added in all patients with a view to preventing anaerobic infection. A swab sent on day 7 showed no growth of organisms in 18 of the infected wounds while a swab sent on day 14 showed all wounds to be sterile. Human placental extract has an effective inhibitory role on the growth of different bacteria e.g., E. coli, Staphylococcus aureus, and fungi e.g., Saccharomyces cerevisiae and Candida albicans as reported by Piyali Dutta (12) . Drug resistant strains such as E. coli DH 5a Pet 16 AmpR and Pseudomonas aeruginosa CamaR also were significantly inhibited by the extract. The extract was both bacteriostatic as well as fungistatic as seen in this study. It was further seen in this study that there was a dose-dependant response and its antimicrobial activity was retained after heating but was lost after dialysis. These findings have been corroborated by Pati (13) . However, even though the wounds were bacteriologically sterile, they were not free of slough, discharge or signs of local inflammation at the onset of the actual study. Chronic ulcers are a vexatious clinical problem for which a variety of measures have been used. Despite treating the underlying aetiology which may be arterial disease, venous disease, diabetes, post burn, post traumatic or a host of other conditions, some do not heal. To accelerate healing, various topical agents are being used regularly. Usage of tissue extracts has been gaining popularity following studies by Filatov who in 1933 demonstrated the existence of so-called ‘Biogen Stimulators' or ‘Biostimulin' in living tissues. Though studies using placental extracts for dressing of chronic wounds have been conducted more recently, use of amniotic membrane for wound cover has been in vogue since quite some time and more documented studies are available. Amniotic membrane from human normal-term placentas of mothers with HIV- and HbsAg-negative status has been used as biological dressing for burns. In a study of 350 patients with burn wounds, it was seen to decrease pain at the local site and promote early epithelialisation. A shorter hospital stay was also reported, reducing dressing bulk and overall cost of treatment (2) . Other studies have reported similar benefits (3,4) . The aqueous extract of human placenta contains various enzymes such as alkaline and acid phosphatase, glutamic acid and oxaloacetic acid. It also contains nucleotides such as RNA, DNA, and ATP; vitamins such as B10, B6 and B2 as well as pantothenic acid, biotin, para-aminobenzoic acid, folic acid, B12, choline and inositol; amino acids such as alanine, tryptophan, valine, leucine, lysine, phenylalanine as well as cholesterol, fatty acids, steroids and trace elements. These components exert multiple biological activities, including anti-inflammatory and immunomodulatory activities. The anti-inflammatory action of the placenta is thought to be mediated by inhibition of prostaglandin synthesis or platelet aggregation or by stimulation of lipocortin formation (5) . It has also been seen that the human placenta produces many hormones besides Human Chorionic Gonadotropin and Human Placental Lactogen. In this study, it was seen that there was a corticotropin releasing factor (CRF)-like activity in extracts of human placenta. It was also inferred that the material with high CRF-like activity from the placenta was probably a peptide because its activity could be attenuated by trypsin digestion. Growth factor-like activity (6) , pigmenting activity (7) and keratinocyte-proliferating activity (8) has also been reported. Placental extracts also stimulate angiogenesis as graded by the Microscopic Angiogenesis Grading System (MAGS) (1) . The MAGS scoring is the best objective assessment of wound healing. Significantly better and earlier histopathological evidence of healing was seen in terms of vascular proliferation (angiogenesis), endothelial cell hyperplasia and endothelial cytology in all the study group patients on placentrex, as compared to those on normal saline dressings. Placental extract in the form of PLACENTREX is an excellent agent for topical application in the dressing of non-healing wounds. It exhibits marked anti-inflammatory activity and is an effective desloughing agent even when used as the sole agent for local application. It helps in development of healthy granulation tissue with angiogenesis and endothelial cell hyperplasia much faster as compared to wounds where it was not used. It therefore allowed the definitive method of wound closure or cover to be performed earlier, thus reducing morbidity, hospital stay and expenses of the patient. It has no side effects or adverse reactions, is easily available and cheap and is, therefore, patient-friendly. Based on the above, we have no hesitation in suggesting its regular use as an agent for topical application in non-healing wounds. I wish to acknowledge with gratitude Dr. Nilay Chakrabarti, Professor and Head, Department of General Surgery. It has been my privilege to work under his able guidance and supervision. We would not have been able to complete this research without his help and support. We are greatly indebted to Dr. V. V. Dewoolkar, Dean, K. J. Somaiya Medical College and Research Centre, for his encouragement and valuable guidance and giving us permission to perform this study. Our profound sense of gratitude goes to my esteemed teacher, Dr. Ratnakar Shetty, Associate Professor, Department of Surgery, for his meticulous supervision, helpful advice and healthy criticism in preparing this paper. We are thankful to Dr. Radha Varma, Associate Professor, Department of Surgery, for her guidance and sincere advice. We express our obligations and thanks for the help and support to Dr. Kiran Somani, Associate Professor in Surgery. We are indebted to my teacher Dr. Pushpa Koli, Lecturer, and Dr. Manjusha Sailukar, Paedatric Surgeon, Department of Surgery, for their guidance, sincere advice and constant encouragement throughout. We express our special thanks to the Dept. of Pathology, Bombay Hospital/ Dr. Chitale for their valuable help for histopathological work. Our sincere thanks to M/S Albert David Limited, Kolkata, for their helping hands in this work. We express our deepest sense of reverence and gratitude to my family. Words cannot express my feelings of indebtedness to them. 1. Brem S, Contran R, Folkman J. Tumor angiogenesis: A quantitative method for histologic grading. J Nat Cancer Inst 1972; 48: 347-356. 2. Ramakrishnan KM, Jayaraman V. Management of partial-thickness burn wounds by amniotic membrane: A cost-effective treatment in developing countries. Burns 1997; 23 suppl 1, 533-536. 3. Quinby WC Jr, Hoover HC, Scheflan M. Clinical trials of amniotic membrane in burn wound care. Plast Reconstr Surg 1982; 70: 711-717. 4. Ding YL, Han CN. Recent advances in burn wound management in china. Acta Chir Plast 1989; 31: 2, 84-89. 5. Sur TK, Biswas TK, Ali L, Mukherjee B. Anti-inflammatory and anti-platelet aggregation activity of human placental extract. Acta Pharmacol Sin 2003; 24: 187-192. 6. Mukherjee B. Pharmacology and biochemical screening of placentrex. Department of Pharmacology, University College of Medicine, Calcutta University, WB. Quarterly project report: January-March 1997. 7. Pal P, Roy R, Dalth P K, Dutta AK, Biswas B, Bhadra R. Hydroalcoholic human placental extract: skin pigmenting acitivity and gross chemical composition. Int J Dermatol 1995; 34: 61-6. 8. O'Keefe EJ, Payne RE, Russell N. Keratinocyte growth-promoting activity from human placenta. J Cell Physiology 1985; 124: 3; 439-445. 9. Barnett A, Berkowitz RL, Mills R, Vistnes LM. Comparison of synthetic adhesive moisture vapour permeable and fine mesh gauze dressings for split-thickness skin graft donor sites. Am J Surg 1983; 145: 379-81. 10. Saraf S K, Shukla VK, Kaur P, Pandey SS. A clinico-epidermiological profile of non-healing wounds in an Indian hospital. J Wound Care 2000; 9: 247-250. 11. Knighton DR, Ciresi KF, Fiegel VD, et al. Classification and treatment of chronic nonhealing wounds. Successful treatment with autologous platelet-derived wound healing factors (PWDHF). Ann Surg 1986; 204: 322-330. 12. Chakraborty, Piyali Datta and Debasish Bhattacharyya. In vitro growth inhibition of microbes by human placental extract. Indian Institute of Chemical Biology. 13. Pati S, Saumandal BK, Bhattacharyya AK, Saumandal P. Clinical evaluation of effects of dressing in the treatment of infected wounds. J Obstet Gynaecol India, 2001, 51, 124-126.